Every week 12,800 people support Wirral Hospice St John’s by taking part in our lottery. With more and more people engaging with the Hospice and the lottery, we receive many questions about it. Today I took the some of the most frequently asked questions to the man in the know – Ian Jones, Lottery Manager. So Ian, thanks for taking the time to answer some questions. Firstly I find that people often wonder how £1 per week helps the Hospice, can you tell our readers how lottery membership helps the Hospice? Well, £1 may not seem like a lot, however it helps provide the equivalent of 10 specialist nurses at the Hospice, allowing for patients to receive the care and support that they need during their time with us – £1 goes a long way! 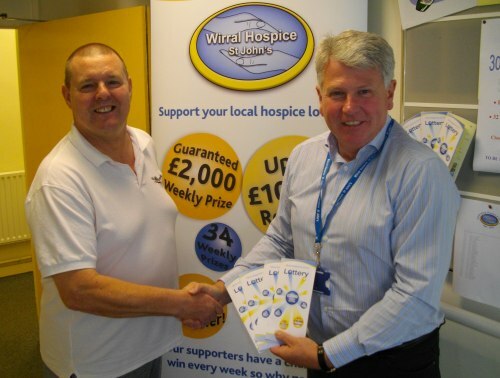 How can people join Wirral Hospice’s lottery? It’s really easy, all you need to do is call the lottery team on 0151 343 0348, or visit our website and download an application form. We also have lottery staff on hand at many local events and daily within the community who will be able to sign you up! Once someone has become a member what happens then? Once you have paid your £1 weekly membership you will receive a letter with your numbers on, you can check the weekly draw numbers on the Hospice’s website, on facebook, in our charity shops, in all Asda Wirral branches and all Wirral libraries, you can also call the lottery team on 0151 334 0348 and a member of the team will be able to tell you the numbers. I sometimes hear from people that they have been in the lottery for a while and haven’t won yet – what do you say to those who are yet to be lucky winners? Since the lottery started, over 35,000 local residents have won a prize, 700 local residents have also won our weekly top prize of £2,000. You might be interested to know that the odds of winning the Hospice lottery are higher than that of the National lottery and our tickets are half the price at only £1! That sounds like a lot of winners over the years, what prizes can players win? This week’s rollover is already up to £2,500! So, when I win, how do I claim my lovely prize? When you win you won’t need to claim your prize – all winners are sent their cheque by 1st class post each Friday after the draw has been run. Any final fun facts to tell our readers? Well, over the years we have had three winners who have won the £10,000 rollover, with many others winning various rollover amounts. Surprisingly, the first ever rollover winner won on Friday 13th! On one occasion a lady won the top prize of £2,000, this meant that she was able to buy a stair lift ensuring that she was able to remain in her own home; in her case winning changed her life! Finally, as a rule most people support our Hospice lottery because of the cause it supports – prizes are just an extra bonus. The lottery is a fun and exciting way to support the Hospice, I know I’m keeping my fingers crossed for a win!